What should I do if I have blood in my urine? Your GP will normally investigate blood in the urine as a matter of urgency. Most GPs will perform some simple, baseline tests. You may be started on antibiotics to treat a presumed infection. However, if the urine test result comes back showing no evidence of infection, you will normally be referred to your local urology department for more detailed investigations using the "2-week wait" (fast-track) system. 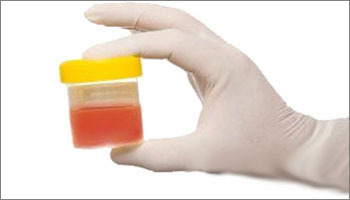 What are the facts about blood in the urine? Your GP will ask you questions about any recent symptoms, any associated matters (including any drugs you are taking) and will enquire about smoking habits. Exposure to industrial chemicals or to substances that may be related to bladder cancer development are also important. You should inform your GP if you are taking blood-thinning drugs (warfarin, dicoumarin, rivaroxaban, prasugrel or dabigatran) or if you take anti-platelet treatment (aspirin, dipyridamole, clopidogrel). If the bleeding is painless and associated with clots of blood in the urine, it is likely that your GP will arrange urgent referral to a urologist. A general physical examination will be performed, together with a rectal or vaginal examination. Your blood pressure may be measured as part of this examination. What could have caused the blood in my urine? intravenous urogram (IVU) - may involve an iodine-based injection; see allergy advice above. This is a telescopic check of the bladder. It is performed under antibiotic cover & local anaesthetic using a small, flexible telescope which allows the clinic doctor to see inside your bladder (pictured). Download an information leaflet about flexible cystoscopy. If you have concerns about this, or have experienced problems with local anaesthetic in the past, you should ask about having your examination under a brief general anaesthetic (i.e. whilst you are asleep). Download an information leaflet about examination under general anaesthetic. If an abnormality requiring further treatment is detected, the medical staff will advise you on what treatment is necessary and what this would involve (e.g. admission for telescopic removal of a bladder tumour, as shown in the video below, courtesy of Mr Nigel Bullock). Download an information leaflet about this procedure. If no specific abnormality is found, you should report any further bleeding, or other urinary symptoms, to your GP who will be informed of the result of your assessment. NHS Campaign - "Blood in Pee"